So last night after a crazy turn of events I managed to spill a whole glass of water over my ihome which started blaring Mexican radio and needless to say all my designs for a restful night of sleep were over. Even more unfortunate for me is the fact that I fall asleep to the sounds of either a "long soothing rain" or the ocean. But alas, without my ihome I can no longer here these noises that lull me to sleep each night, so I been laying here for about an hour without sleeping. I am guessing I am not the only person out there that cannot sleep so I thought I would explore some tricks I will be using shortly after finishing this blog to get my beauty sleep. - Aromatherapy. There are lots of skeptics out there about how true the effects of aromatherapy are. However for me I really do think it works. There are a couple of scents I feel like relax me and help me sleep. 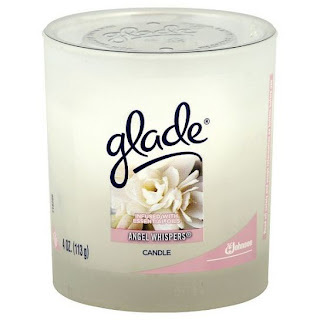 My favorite candle right now is from glade. The scent is called angel whispers and it has sort of a flowery smell that is really light. I feel like its just really unobtrusive and relaxing and it does help me sleep. I also did some research that confirmed what I already thought. Lavender is also supposed to really help you sleep. According to the Sense of Smell institute lavender not only helps you to fall asleep but it also helps you to get better more restful sleep. Sounds good to me! - Light training. What I mean by light training is to make sure that you turn of all most if not all light at least 30 min before you want to go to bed. Small lights are OK but the basic idea is that you are in a dim room without direct light on you. The reason this works (disclaimer: I am a psychology major so I do have a background in this but I have watered down the science a little into a more easily digestible form) is because a gland in your brain called the pineal gland secretes a hormone called melatonin when its time for you to get sleepy. Melatonin is counteracted by light meaning that even if you are really tired and it is really late, if your body detects a lot of light it will mess up your rhythms and tell your body its not time to sleep yet. -Melatonin. I am not a doctor nor can I prescribe medicine but I can tell you that taking an over the counter melatonin supplement can really help me when I get in a bad sleep funk. You can buy melatonin at you local drug store in the vitamin section. I trust this supplement because it is the same as the hormone already secreted by your body so it is not habit forming all though they do suggest you don't take it for more than two weeks continuously because you can build an immunity to it. I use melatonin when I get into a weird sleeping schedule that I want to break, like after a big test or something. -Stop worrying! It is nearly impossible to sleep when you are just sitting there in the dark worrying about something or another. Find something that works for you to clear your mind. For me i say a little prayer then read a couple chapters in a book. I know some of my friends meditate or do some exercises. whatever it is that works for you, just get your mind off whatever is bothering you. There is plenty of time to stress tomorrow. OK it is now time for me to take my own advice and get some well deserved beauty sleep!